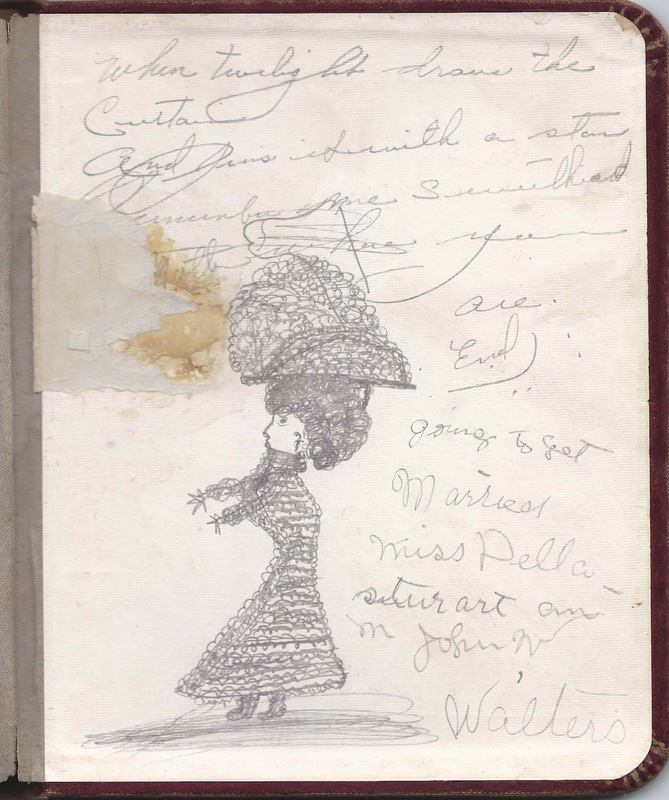 1880s autograph album that originally belonged to Helen Hazlett Payson at Fordham in the Bronx, New York, but was later taken over by Julia Virginia Painter, who signed many pages and doodled on others, including pages earlier used by signers. 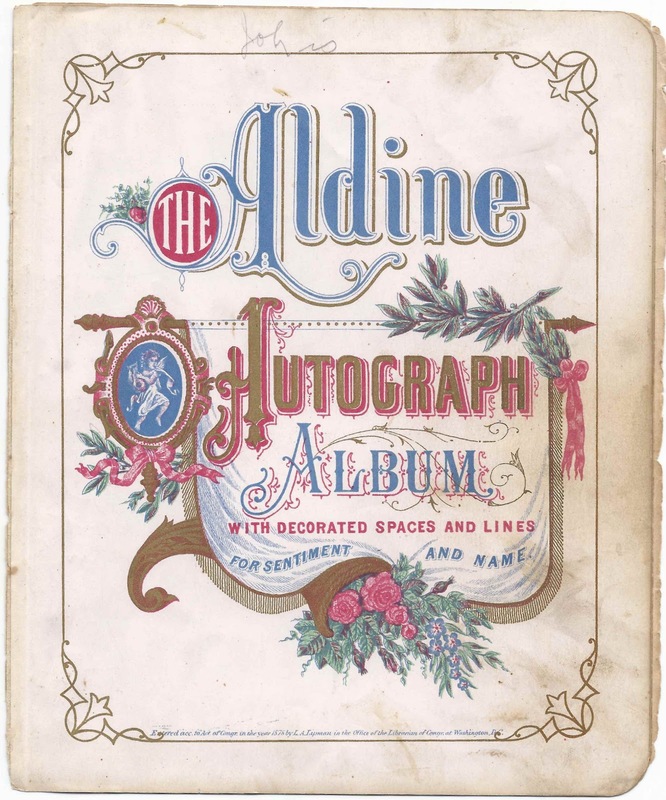 The album was presented to Helen H. Payson, or "Nellie", by Harry Gale at Fordham, New York, at Christmas 1886. Harry signed another page on Christmas Day in 1886, near the end of the album. 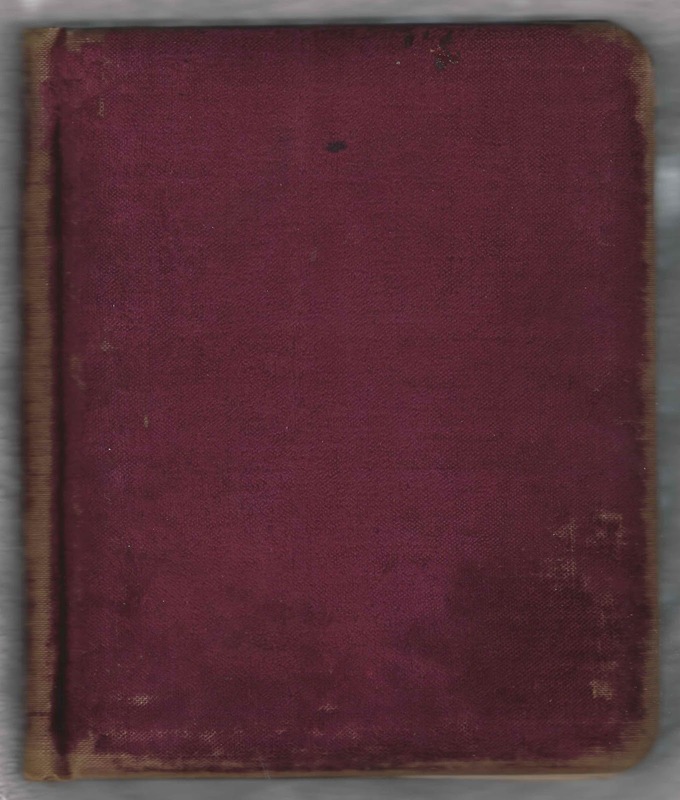 The album is approximately 8-1/4" x 7-1/4" and contains the sentiments of about 50 people, some of whom wrote on more than one page; additionally there are many pages of writing that are unsigned. An alphabetical list of the signers appears at the end of this post. Several of the signers mentioned the initials H. F. I, which I had originally thought was an educational institute or institution but came to realize, sadly, was the Home for Incurables, which eventually became St. Barnabas Hospital, founded in the West Farms area of the Bronx in 1866. 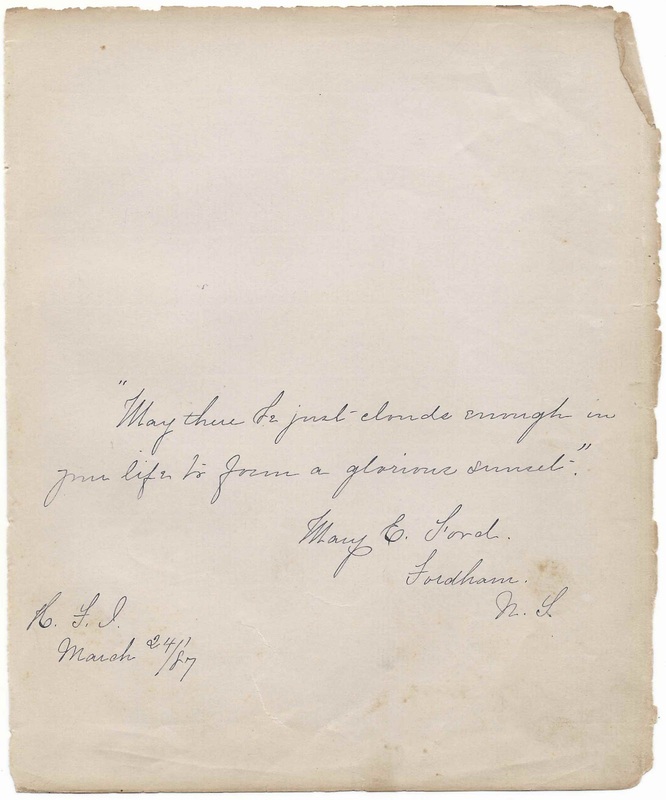 Mary E. Ford of Fordham, New York, signed a page on March 24, 1887 and included H. F. I.
Emily Walls signed at H. F. I. Hotel on December 7, 1896. 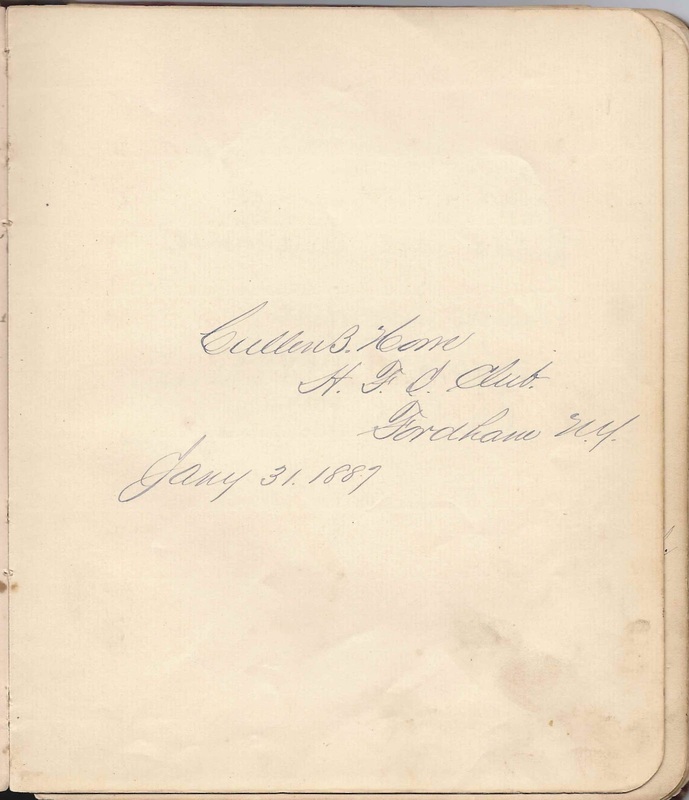 Cullen B. Howe signed at H. F. I. Club at Fordham, New York, on January 31, 1887. 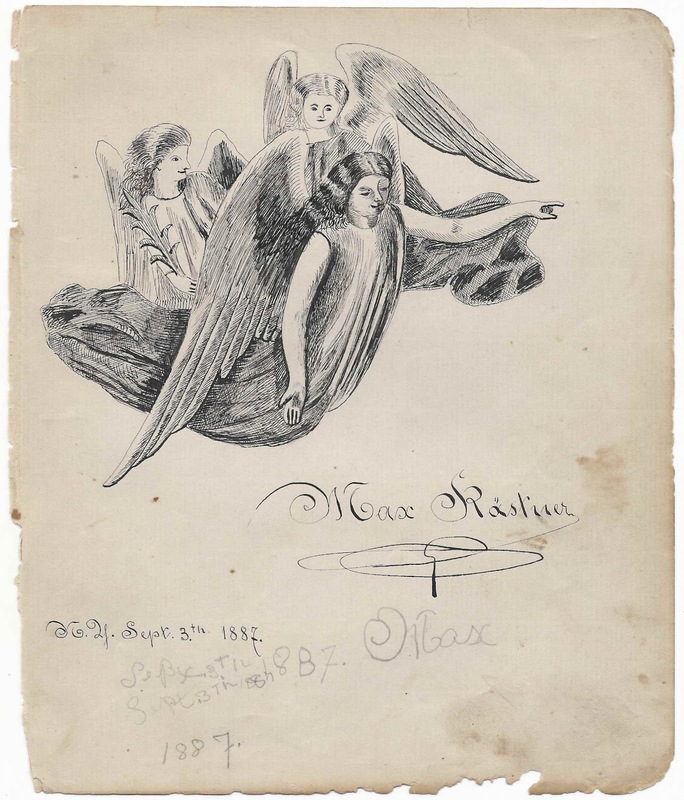 Max Rastner or Max Kastner signed a page at H. F. I. on September 3, 1887. 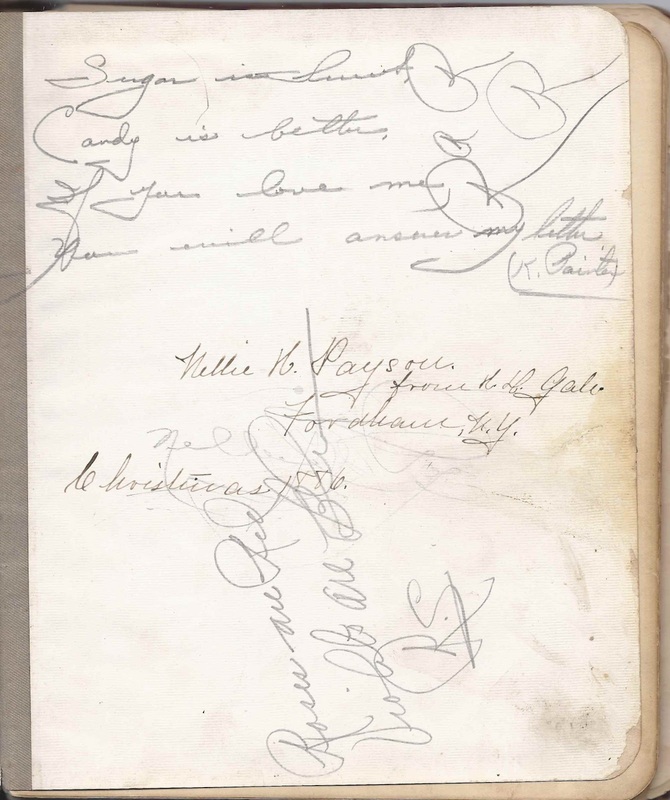 Two doctors signed pages in Nellie's album. 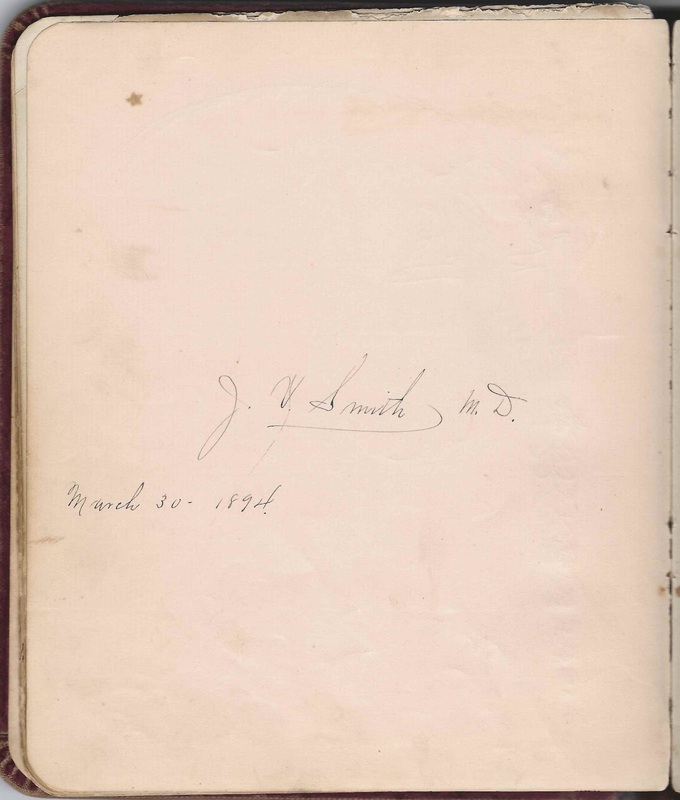 J. V. Smith, M.D., signed a page on March 30, 1894. 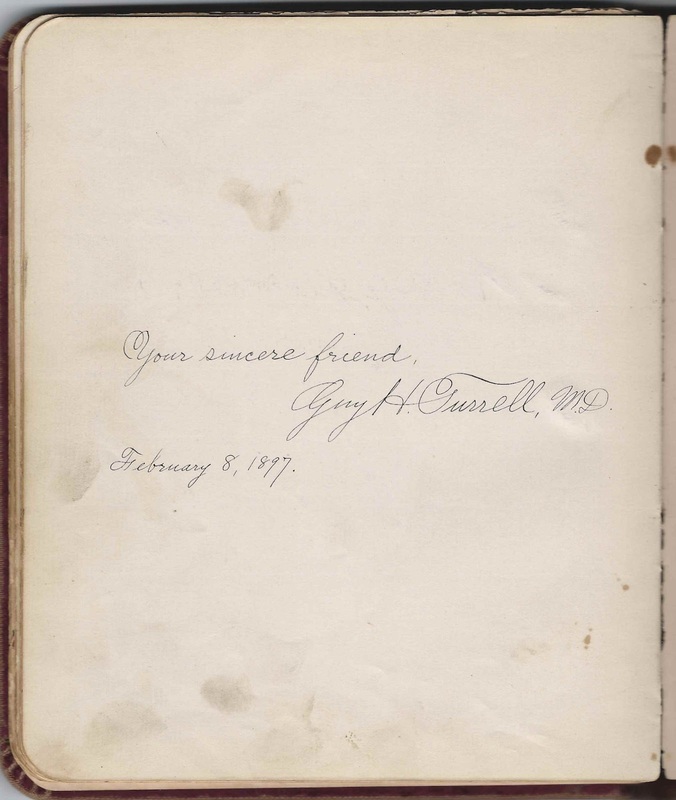 Guy H. Furrell, M.D., signed a page in December 1897. Helen Hazlett Payson, "Nellie" was born about August 1867, daughter of Rev. Edward Phillips Payson and Grace (Hazlett) Payson, who were born in Connecticut and New York, respectively. She had at least four younger siblings. Nellie's father came from a family of ministers. 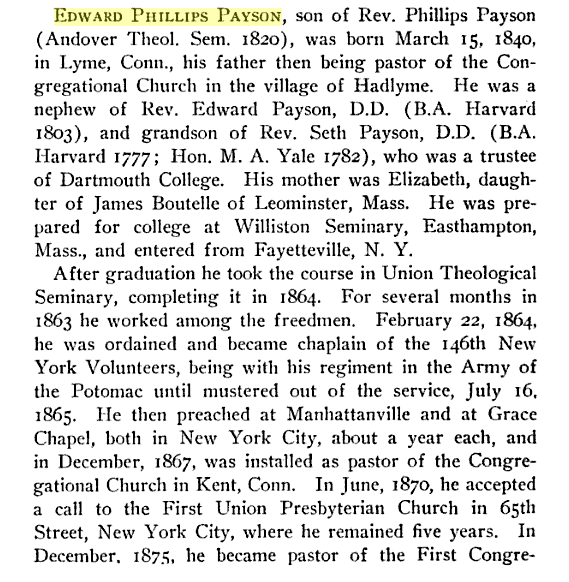 Below, his obituary in the 1915 Obituary Record of Graduates of Yale University. I found Nellie living at the Home for Incurables at the time of enumeration of the 1900 Census. Thanks to the reader's comment below, we know she died on 24 October 1904 at the Bronx. Rev. 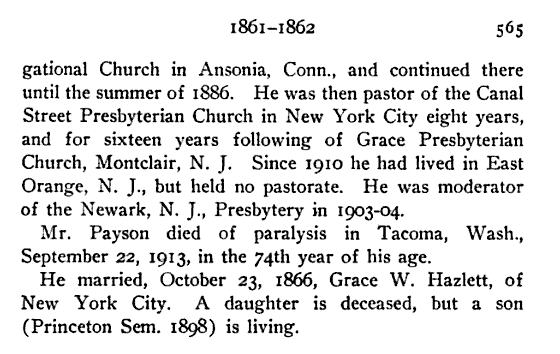 Payson died in 1913 at Tacoma, Washington, and Grace (Hazlett) Payson died at East Orange, New Jersey, in 1917. If you have additional information on Helen Hazlett Payson or her family, please leave a comment or contact me directly. 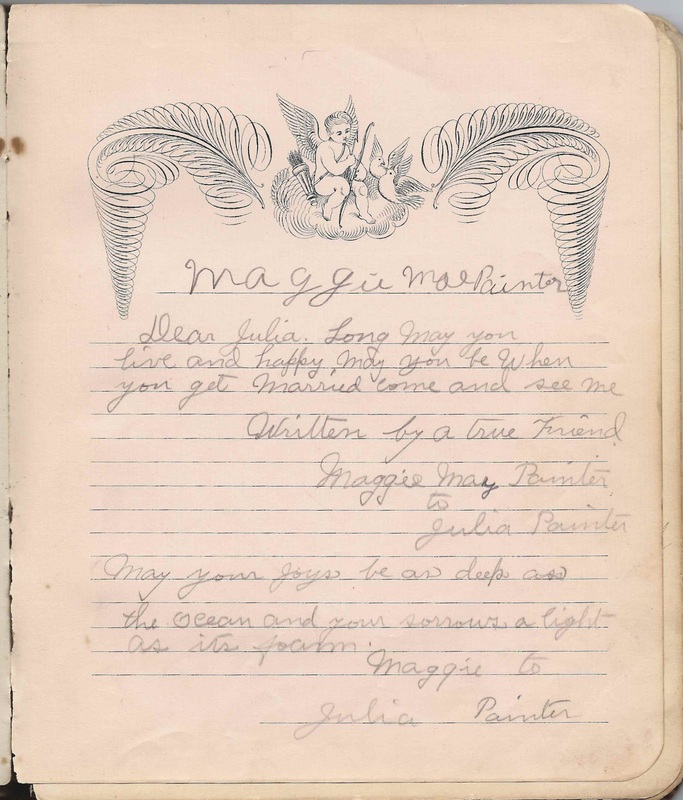 I'm also intrigued by how the album came to be in the possession of young Julia Virginia Painter, daughter of John W. Painter and Nellie Catherine (Fadeley) Painter of West Virginia. Julia was born 17 November 1898 at Hall Town, West Virginia. She would marry Robert Lyton in 1927. 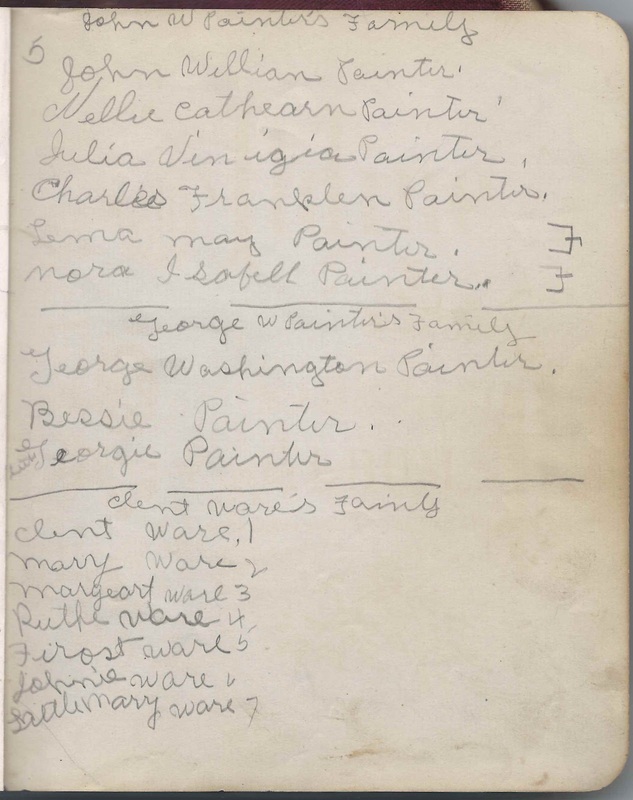 Julia Virginia Painter signed many pages in the album, sometimes over a page already used, but one page was especially interesting, where she listed the members of the John William Painter Family, the George W. Painter family and the Clint Ware family. 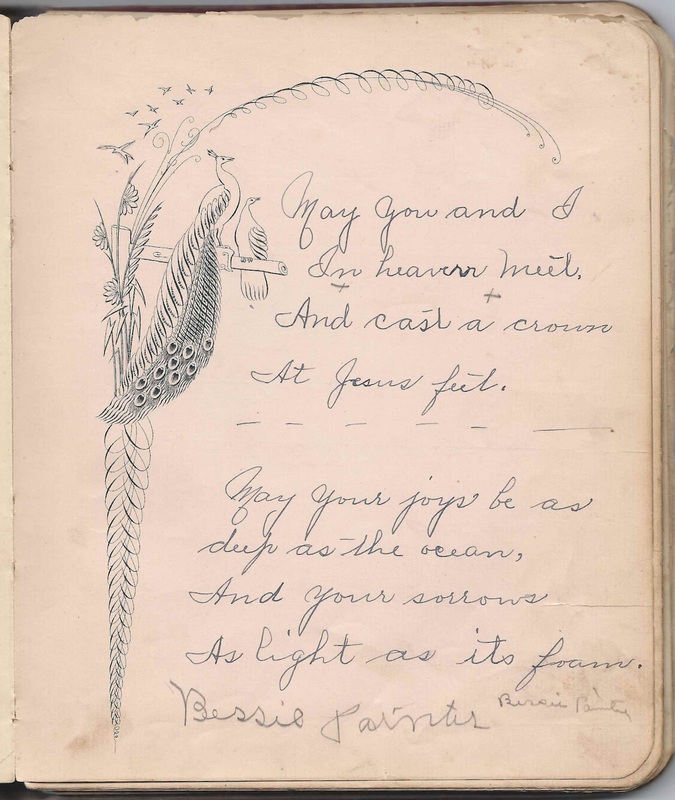 Bessie Painter signed a page. Maggie Mae Painter signed a page. The inside back cover mentions Miss Della Stuart and Mr. John W. Walters. If you have information on the Painter and Ware families, please leave a comment or contact me directly. Thanks! B. 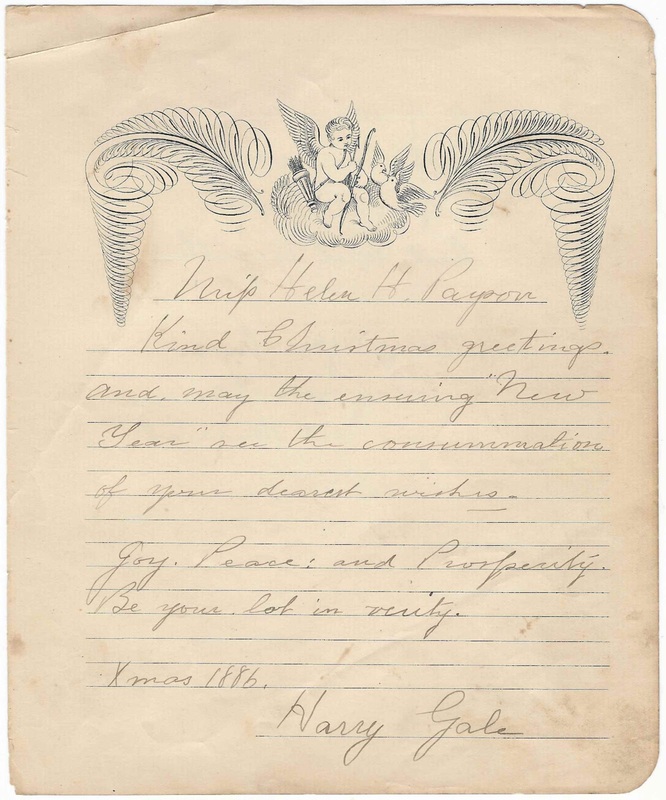 B. T. to J. V. P.
Harry Gale, signed at Christmas in 1886. He is presumably the H. Gale who presented the album to Miss Helen H. Payson at Christmas 1886. 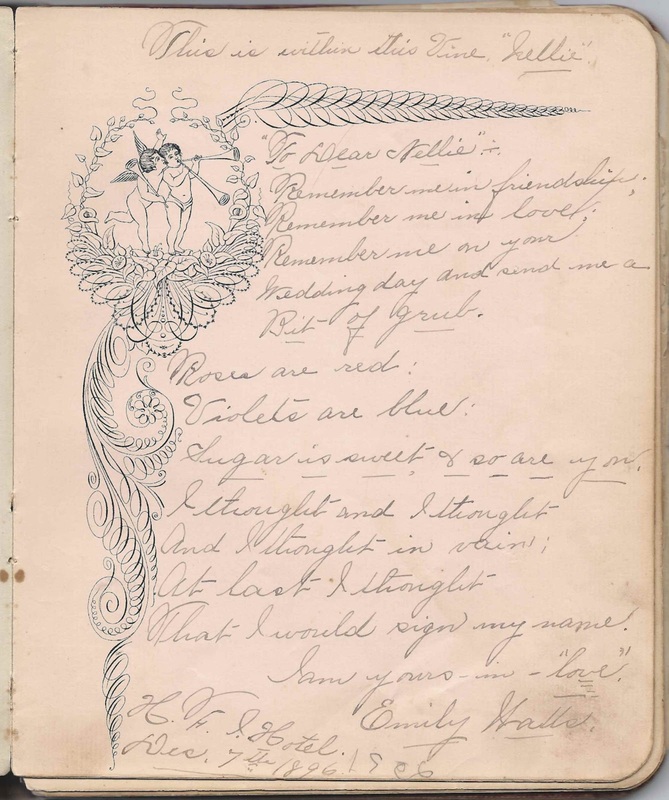 Annie Hawkins, signed on June 5, 1887; Julia Painter wrote on the page in 1910. Cullen B. Howe, of H. F. I. Club, Fordham, New York, signed on January 31, 1887. Not sure of surname of initials of Club. Clara Pinckney, signed at Fordham, New York, in July 1887; middle initial might be M or W or ? Nellie H Payson, age 37, died October 24, 1904, in the Bronx. Certificate # 5504. Thanks, Ed. Another good resource I've found is...Ed!